Teaching in Paradise: Happy Easter and a Freebie to Celebrate!! Happy Easter to Everyone out in Bloggy World!! :) I hope you are all enjoying this wonderful and beautiful day with your family and friends, and of course..Good Food!! This will be a quick post because I need to get the chicken frying and desert baking. We are heading to my boyfriend's parents house for Easter dinner! I haven't even begun cooking yet. Anyways, I haven't uploaded a freebie in awhile so here is more morning math work! This file will contain all sheets to be used for the entire month of April. I've uploaded this file to my TPT store so go ahead and get your free copy!! It will only be free until Monday, then it will become my first item that I will be selling! I don't know who you all do it with your units. This took me so long to format (probably because I did it in word). I usually type my math sheets up in word but think from now I will do it in powerpoint. I made my cover sheet in power point but couldn't figure out how to transfer my word document over to PPT. Any tips?! Alrighty...well there I go rambling again!! 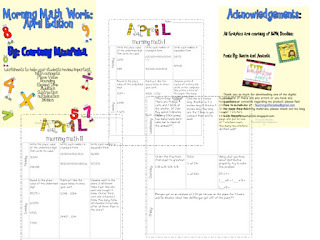 Please head to my TPT Store to grab your copy of my morning math sheets.